In Brazil, some 2,000 athletes from many indigenous ethnic groups and 30 countries are taking part in the first World Indigenous Games. The event in the northern Brazilian city of Palmas officially gets starts on 23 Oct and will end on October, 31st. President Dilma Rousseff is expected to attend the lavish opening ceremony. Yesterday, the participants took part in a traditional fire lighting ceremony in Palmas’s central square. 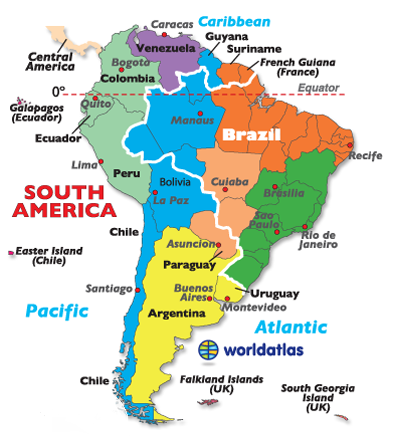 Location of Brazil on Map. Indigenous peoples from countries including Ethiopia, Mongolia and Brazil sang and danced at the ceremony, dressed in traditional outfits. The football tournament also began on Thursday. Among the sports included in the games are archery, spear tossing, canoeing and a race through the forest. There will be non-competitive events showcasing the many different traditions of indigenous ethnic groups involved, such as a football-style game called xikunahity in which the ball is controlled only with the head. It is played in the Matto Gross region of Brazil. As well as peoples from across the Americas, there are delegations from Australia, Russia, the Philippines, Ethiopia and New Zealand. From Brazil alone, 24 different indigenous groups are taking part. Following the success of the 2014 FIFA World Cup, Brazil has consolidated its position as a leading host of sporting mega-events. The next challenge it faces is the realisation of the first World Indigenous Games (I-Games 2015), a multisport event with over 2,000 participating indigenous athletes from 30 countries that will be taking place in Palmas (TO) from the 23rd of October to the 1st of November. The first World Indigenous Games are a project conceived by Marcos Terena’s Intertribal Council (ITC), and grew from the national Jogos dos Povos Indígenas that began in 1999. It is a joint effort by the ITC, the Brazilian Ministry of Sport, and the Municipality of Palmas.